The ancient temples of Siem Reap’s Angkor Wat is another destination that I have had the good fortune of visiting not once but twice. Those trips were before this blog became a reality. From the sunsets to the windows, trees, and ancient doorways, I loved it all, and would return in a moment. 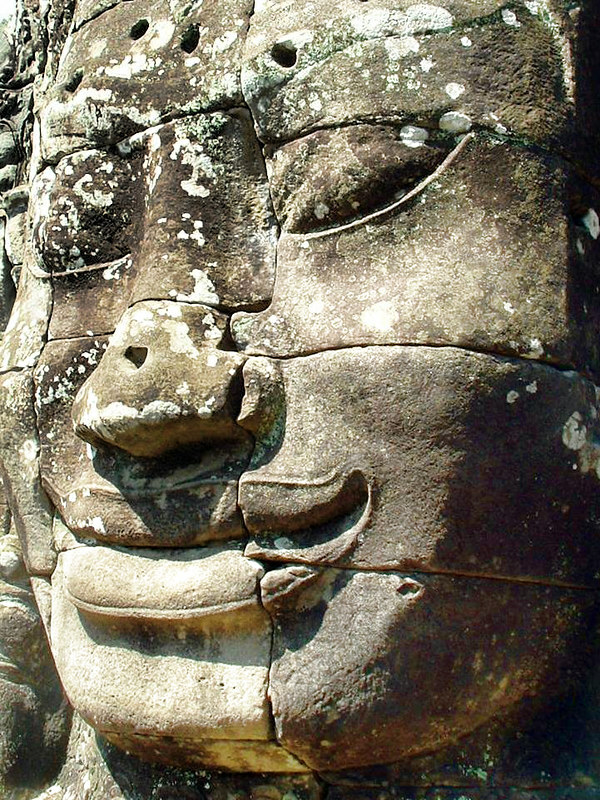 An intricately carved Bayon Head dating back to the 12th century. Have you been to Angkor Wat? Did it meet your expectations? 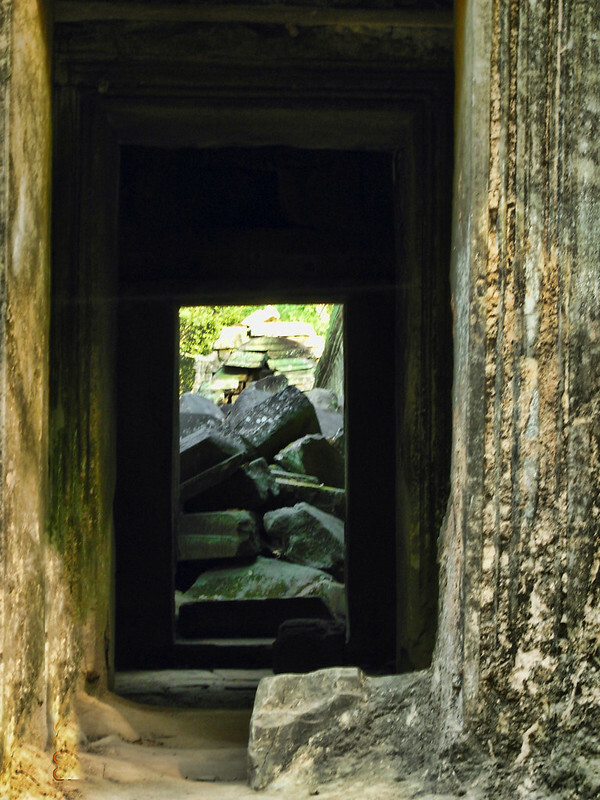 Angkor Wat is open daily from sunrise to sunset, and you’ll need a pass to enter. You can purchase one, three, or seven day passes. When I visited in 2005, and 2007 you had to use your pass over consecutive days. Thankfully that has changed. Three day passes are valid for a week, and the seven day pass is valid for one month. The heat of Cambodia, and climbing around ancient temples takes it toll. I highly recommend that you don’t visit the temples three days in a row. Give yourself a break from the heat. You need transportation. The first time I hired a motorcycle “cab”, which I loved. At $10.00 a day, it was a steal. I can imagine that the price has increased over the years. I did a quick Google search, and prices now seem to range from $15.00 to $30.00 for a day. Best to arrange this through your guest house. The price will include picking you up to get there for the sunrise. I have also hired a car and driver, and (obviously) that is considerably more expensive. Definitely, a very comfortable option, and one way to beat the heat. Check out the forums on Trip Advisor of recommendations. The better drivers get booked out quickly. Dress for the heat, and be sure to wear good walking shoes. Beautiful! Cambodia is on my bucket list. These temples are remarkable. What a fascinating place.Angkor Wat has been on my list for a long time, but still didn’t make it there. 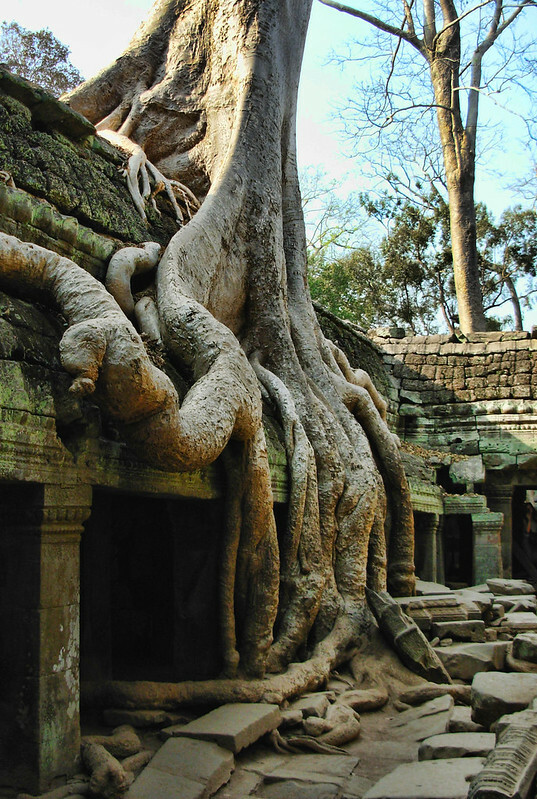 I love those roots of those trees growing through the ruins… great photography spot. Anda…There are so many photo ops! Excellent tips. I thought that living in hot and humid Penang would prepare me for Cambodia, but Siem Reap was somehow even hotter and more humid. I splurged and got an air-conditioned van and driver. That photo of the sunrise with the horse in the foreground is fantastic. Nancie, I think everyone that has ever visited Angkor Wat has loved it. How can you not? It’s a beautiful place. My sister just came back from there as well, and she cannot say enough about it! Beautiful shots! And thanks for linking up with Weekend Travel Inspiration! Hi Kathy. I’ve been twice and would go back again. Not a huge fan of Phnom Penh, mainly because of all the grim reminders of the war, but worth a visit. Next time I go I want to visit the beach area. Hi Corrine. The second time I went I traveled with a friend, and she wasn’t all that keen. I think a lot of it had to do with the heat. 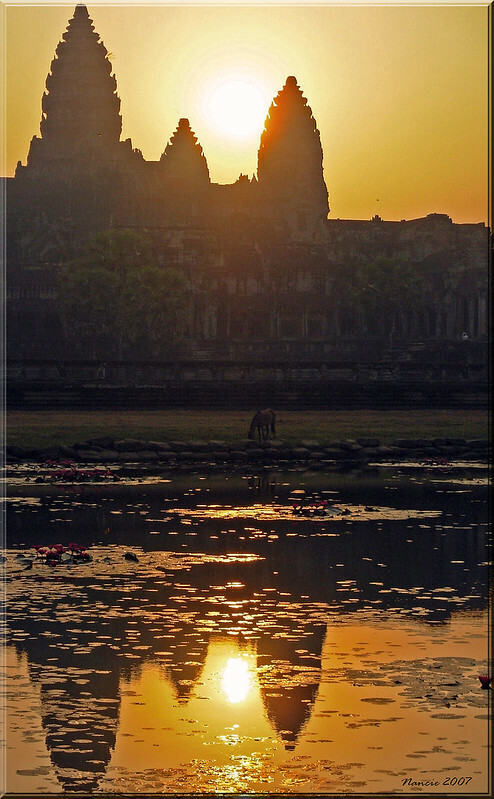 I loved looking at your Angkor Wat photos. They transported me back to our time there. The smiling faces were one of my favourite temple sights. I thoroughly agree that if time permits spacing the temple visits out between rest days is the way to go. Hi Jan. I agree, the Cambodians are almost always smiling, and the kids seem so happy. (Not meaning this to be cynical…but I do think that often that’s for the tourists.) I think the kids have difficult lives. Lovely pictures which really capture the beauty of this place. I’ve never been to Cambodia but I know this is THE place to go in the country. Thanks for digging out these old and amazing pictures. Hi Guy. My pleasure! and if you ever have the chance to visit Angkor Wat you won’t be disappointed! The first photo was so evocative that I felt like I was stepping inside with you! 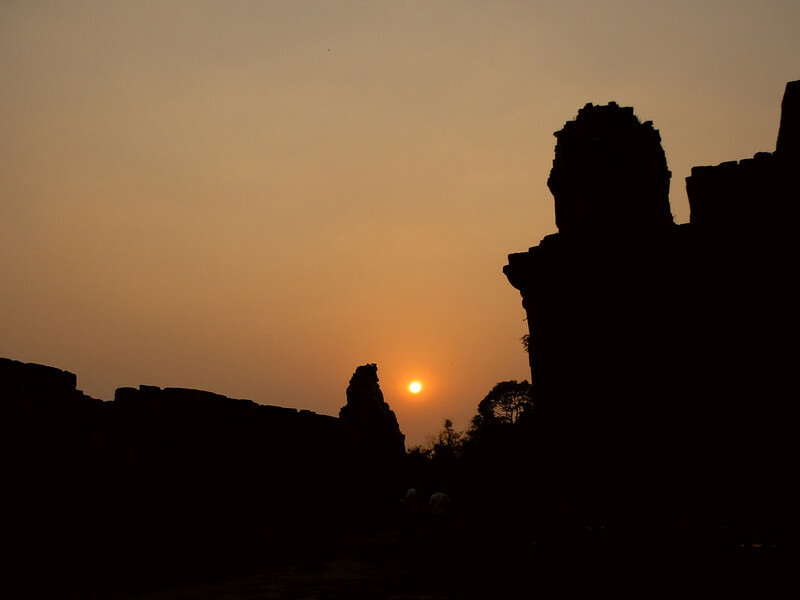 Thanks for taking us to Ankor Watt, its been too long….I’m sure it has changed quite a bit at Siem Reap nowadays. Beautiful photos. Angkor Wat has been on our list for quite a while. We’re hoping to side trip it after TBEX Bangkok. Hi Betsy. That would be a good opportunity. 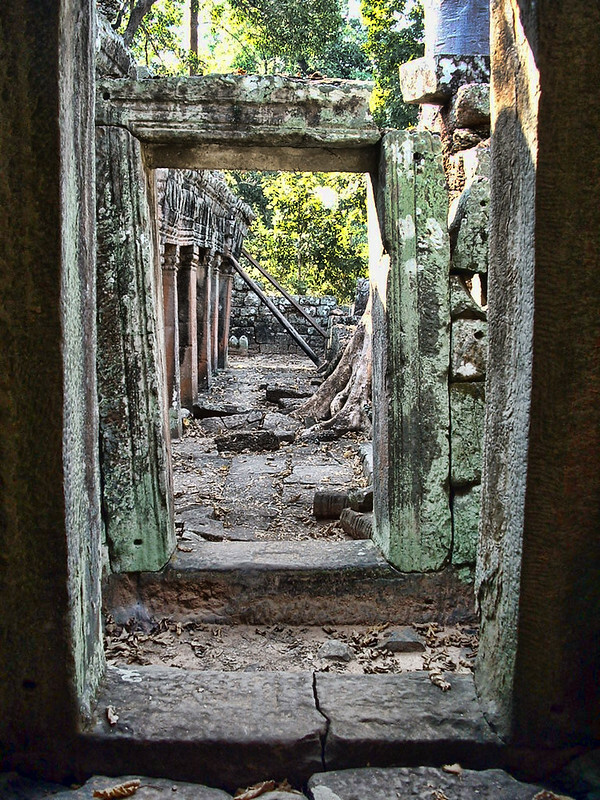 Lovely – some of these pictues are quite unlike the ones I’ve seen of Ankor Wat before, especially the ones with intriguing doorways or tangled trees. Beautiful! I was supposed to go to Angkor Wat last year but the plans fell through. Really hoping to make it next year though, it looks like you had an incredible time! Great photos. I love the trees – so much character. 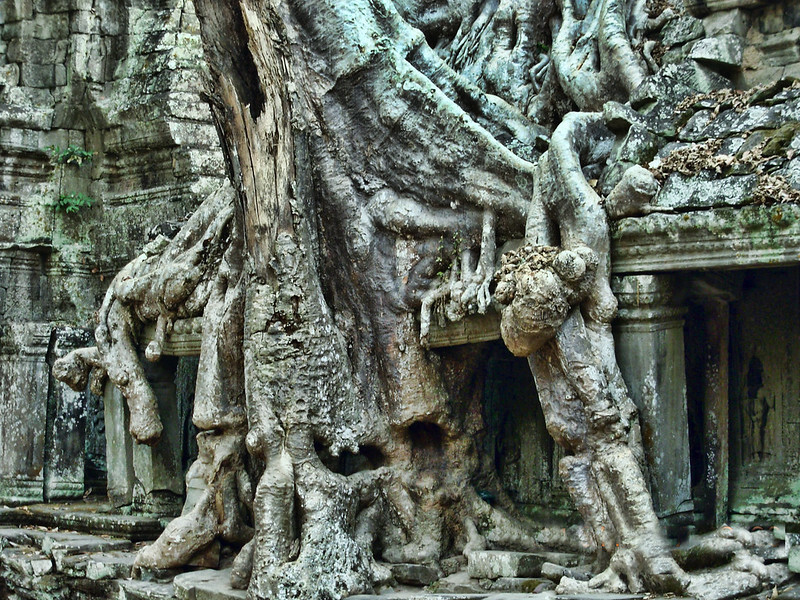 We plan to visit Cambodia next year and Angkor Wat is one of our must see places. The trees are absolutely amazing and all of your pictures portray a stunning beauty. Thanks for your excellent tips. Great photos and trip down memory lane, thanks. I’ve yet to go to Angkor Wat. I’ve heard a lot about the area so I’m very intrigued. A good amount of my travel focus for 2015 will be in SE. Asia. Amazing place. The pictures are breathtaking. The architecture, the shape of the trees.. I am amazed from such beauty. Thank you for sharing this post with us. Beautiful captures from a place I’ve long wanted to visit, Nancie!